Egyptian civilization is one the oldest civilization in the world. For close to 30 centuries the ancient Egyptian civilization was the leading civilization in the Mediterranean world. Apart from amazing innovations in the field of agriculture and architecture this civilization was also blighted with the prevalence of natural disasters, starvation and disease. The ancient Egyptians owe allegiance to one phenomenal creature that protected them and kept the world safe, they are the cats. In a world that had still not discovered guns, insect traps and poison, danger lurked at every corner and time. Venomous snakes hid in clay jars, rats spoilt the grains kept in the storage and scorpions and other dangerous critters tried to creep into cradles and beds. Cats were the only ones who made homes safe for people and protected them from any unforeseen hazard. So, it’s little wonder that Egyptians thought them worthy of being worshipped! Goddess Mafdet was the first deity of ancient Egypt, whom people sought for protection against harmful creatures like snakes and scorpions. She was seen with a variety of fierce forms mostly as a woman with a head of a lion, cheetah or a house cat. As the cats could protect the home from any dangerous creatures either big or tiny, it made the Egyptians home safe thereby making the kingdom safe as well! Later Goddess Bastet replaced Mafdet as the feline goddess. Just like Mafdet the Bastet was highly regarded as the protector of people’s homes and their lives as the cat was famous for its ability to kill snakes, scorpions and vermin. She was famously known as the “Eye of Ra”, which means sun god and they firmly believed that the Bastet watched over them and guarded the world against any invasion. The Egyptians absolutely adored and pampered their cats. They were rightly treated as important members of the family. The Bastet’s image eventually became softer as she became the goddess of fertility, family and love. 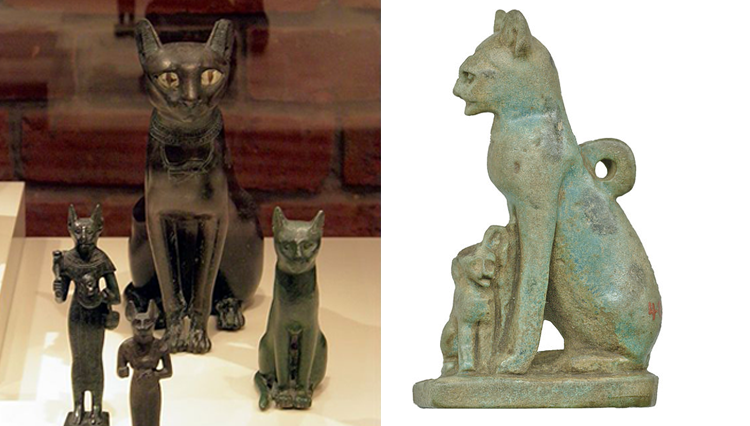 The ardent followers of the cult of Bastet mummified their cats and mourned them as deeply as they do with others human members of the family, which is strikingly similar to the way cat parents mourn their furry family members even today. Since cats do such a wonderful job of protecting their owner’s homes from dangerous creatures and diseases they are entitled to be worshipped. Felines have fearlessly defended so many lives from falling prey to pestilence, destruction and dangerous predators, and without them civilization as we know it, might never have happened! ← Why do cats cover their poop?